An outdoor oasis such as a deck or patio with furniture provides a great place for you to enjoy the summer weather around your home. Plastic outdoor furniture is an excellent, inexpensive option for outdoor furniture but it gets dirty over time from being outside. There are many different cleaning methods and solutions that are effective for plastic outdoor furniture which can revitalize its appearance and make your outside oasis a more enjoyable place. The following are effective tips for cleaning outdoor plastic furniture. When cleaning outdoor furniture, you should start the same way regardless if your furniture is wood, plastic, or metal. The first step should be to remove loose debris with a broom or vacuum and wash the surface with a mix of mild soap and water. This mix should contain a quarter cup of dishwashing liquid in a gallon of warm water and it is safe and effective for all materials. It is best to use a regular hose to rinse off the furniture because a power washer could cause damage. 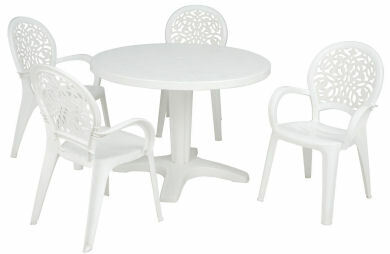 Sometimes the mild soap and water mixture is not enough to remove the stains and dirt from plastic outdoor furniture. If this is the case, try adding two tablespoons of oxygen bleach per gallon of water to the water and dishwashing soap mixture. The sodium percarbonate that is in dishwashing liquid and oxygen bleach reacts in the water to form hydrogen peroxide and sodium carbonate which is a cleaning agent. If this mixture still does not remove the dirt and stains from your outdoor plastic furniture, you can try one of these following cleaning methods. Mix a quarter cup of regular bleach in a bucket with hot water and while wearing rubber gloves, dip a scrub brush into the solution and scrub the surface of the plastic furniture. Make sure to scrub away any dirt that has caked on and give the solution a few minutes to settle on the furniture before rinsing it with a hose. The furniture can then be dried with a cloth or sun-dried. Vinegar is another household item useful for cleaning plastic outdoor furniture. Mix a quarter cup of white vinegar in a bucket with hot water and get a soft bristled scrub brush. Wet the furniture with a hose and scrub the surface with the soft bristled scrub brush to remove all dirt and stains. Rinse the furniture with fresh water and let it dry in the sun. Dishwashing soap should only be used for the toughest stains and it is important to make sure that there is no ammonia in the soap. Chlorine gas is formed when ammonia is mixed with bleach which is dangerous if inhaled. Mix ¾ of a cup of regular bleach and 2 tablespoons of liquid dishwashing soap in one gallon of hot water. Using rubber gloves clean each piece of plastic furniture one at a time with a sponge dipped in the solution and rinse each piece before moving to the next one. Leaving this solution on the furniture too long can cause discoloration. Laundry detergent is another effective stain remover for plastic outdoor furniture. Mix one tablespoon of liquid laundry detergent with one gallon of warm water and use a soft scrub brush or sponge to clean the surface of the furniture. Let the solution settle for about 15 minutes then rinse the furniture off with a hose. Tub and Tile Cleaner: Spray any brand of tile and tub cleaner on the furniture and let it sit for five minutes before rinsing it with water. Apple Cider Vinegar: Spray apple cider vinegar directly on the furniture without diluting it and leave it for five to ten minutes. Then wipe down the furniture and rinse off the vinegar. Baking Soda: Dip a wet sponge into some baking soda and use a circular motion to wipe off the furniture. Make sure to rinse the baking soda well. Washing Soda: Make this solution by combining 1 part washing soda, such as soda ash or sodium carbonate, with 10 parts water. Use this solution to wipe down the furniture and rinse thoroughly. Repaint the Furniture: If your outdoor plastic furniture is still dirty or heavily stained after trying these cleaning methods, you can salvage it by repainting it. First, mark up the surface with fine sandpaper or steel wool, wipe it down, and apply a finish made for plastic furniture. Then apply the primer followed by the water-based paint once the primer is dry. Plastic furniture is a great affordable option for outdoor furniture but it needs regular cleaning because of the dirt it gathers. These cleaning tips will help you keep your outdoor plastic furniture consistently clean and looking new. If you would like your plastic furniture cleaned but do not feel comfortable doing it yourself, you can contact a furniture restoration professional for more information.